Events Center Campaign in Final Weeks, All Asked to Participate! The Harker community’s efforts to meet a $10 million matching gift challenge to build a new events center are coming to a head, with the Oct. 12 deadline for donations fast approaching. Last May, Jeff and Marieke Rothschild (Isaac ’14; Jackiel, grade 11) made a matching gift challenge that will, dollar-for-dollar, match all pledges to the capital campaign up to $10 million until the Oct. 12 deadline, though actual payment can be made through 2016. To maintain Harker’s critical annual giving campaign during the Rothschilds’ challenge, the Board of Trustees and Board of Fellows will match up to $5 million in annual giving donations, but the boards’ matching funds from that effort will be directed toward the events center. This ensures academic programming doesn’t suffer while still adding to the events center challenge. All Harker families will benefit from the new facility. Current students will be able to play or perform in the events center, while alumni and their families will return to campus to enjoy shows and games in the state-of-the-art spaces. The hope is that each family will contribute to the challenge, which will double their contribution and ensure the facility is built as soon as possible. Expected benefits from the new gathering spaces include increased attendance at games and performances, since it will be located in the center of the upper school campus, and thus augment school spirit and pride. “Nothing would make a stronger statement to our community about our commitment to the whole child than the completion of the gym and theater complex,” noted Chris Nikoloff, head of school. In the best-case fundraising scenario, the facility will be open to students as soon as fall 2016, a full year earlier than the best case before the match was proposed. 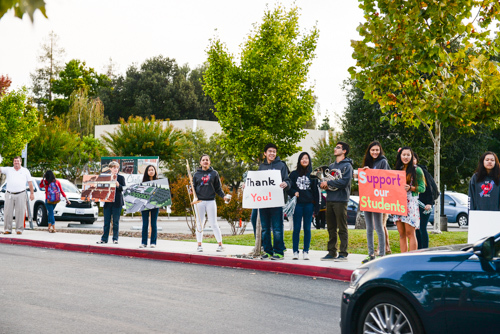 Students will find the state-of-the-art theater and sports facility a huge step up from current facilities, several of which are located at Harker’s other campuses, requiring transportation just to reach them. Pledges must meet the following criteria: first, pledges must be made between April 21 and Oct. 12, 2014; and second, pledge payments must be made in the years 2014, 2015 or 2016. “Marieke and I looked at the Harker community [and] what the school has meant to our children,” said Mr. Rothschild when he and his wife made the gift. The Rothschilds previously had made a $1 million gift to the school to help with the purchase of the Union Avenue campus. They decided to contribute again because they recognize the impact the events center will have on the entire Harker community, and the value in funding and starting work as soon as possible. Not only will the events center have a direct impact on athletes and performers, but also numerous other classes, activities and events will take place in the center, freeing up space in other buildings. Those interested in learning more about the proposed events center can visit www.harker.org/eventscenter to review the “Case for Supporting the Events Center” booklet. A video featuring a virtual tour and several members of the Harker community – students, parents and teachers – sharing the impact they envision the new building will have on the Harker community is also available on the website, alongside Harker’s Vision Statement, which illustrates how the construction of the events center is aligned with Harker’s overall strategic plan through 2020. Those wishing to pledge now can visit the Giving Online page or contact Joe Rosenthal directly at joe.rosenthal@harker.org or 408-345-9266. The deadline is coming fast, so make the best use of your money now and double it by pledging prior to Oct. 12!